People who are extremely sensitive to mold should refrain from working with or attempting to remove mold or handling moldy items. 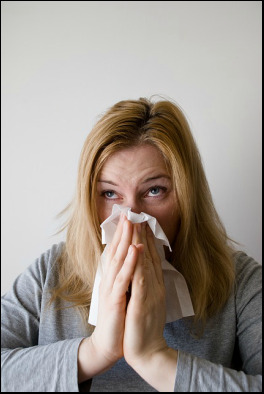 Mold allergy symptoms are very similar to regular allergy symptoms. Mold allergy symptoms can include sneezing; stuffy or runny nose, itching of the inside of the ears, or an itchy throat, rashes or hives, itchy and watery eyes, swollen eyelids, wheezing, coughing and breathing difficulties. Mold-induced asthma. If someone with severe mold allergy inhales mold spores, it can agitate their breathing cause an asthma flare-up. If you know that you have asthma and a mold allergy, be sure to have a course of action and an emergency plan in case a severe asthma attack were to happen. Allergic fungal sinusitis. This inflammation of the sinuses comes from results from a reaction to mold or fungus. Allergic bronchopulmonary aspergillosis. When mold or fungus gets into your lungs. Symptoms include coughing, wheezing, fever and even coughing up small amounts of blood. This particular reaction to mold and fungus in the lungs can occur in people with asthma or cystic fibrosis. Hypersensitivity pneumonitis. This type lung inflammation is caused by the exposure to airborne particles like mold spores. You should definitely avoid or minimize your contact with any type of mold. Key places that are mold prone are, but are not limited to: basements, grass, hay and straw. Basements are often moist places and can help facilitate mold growth. Stray away from cutting your grass or handling hay and straw also. If you must handle these things, be sure to purchase a dust mask to keep the mold out of your air ways. You should be sure to take the appropriate measures to get rid of and prevent mold growth. You can also take medicine to help alleviate your symptoms. Antihistamines, decongestants, eye drops and nasal sprays are among prescriptions that your doctor may suggest. Common types of mold that can be found indoors can easily cause an asthma attack. The most common types are that of, Cladosporium, Alternaria, Penicillium and Aspergillus. This mold is most known for causing asthmatic attacks, and it is a mold that is the most widespread. 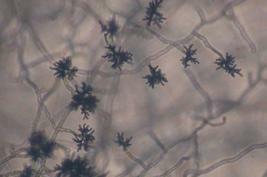 Cladosporium mold has a either a brown, black or green appearance. This mold likes to grow on plants outdoors and release reproductive spores into the wind. Inside, places that tend to be moist will feed colonies, which in turn causes an infestation of spores in your air currents. Inhalation of these spores commonly cause people to have allergic reaction if they have mold allergies. If a colony grows big enough, you'll see dark spots in areas that tend to be wet, like bathroom shower stalls or windows with condensation. Being sensitive to Alternaria can cause hay fever, and unfortunately high risk and even potentially fatal asthma. Up to 70 % of mold-allergic patients have a skin reaction to Alternaria. Even though exposure to Alternaria happens outdoors, you can also come in contact with it indoors as well. You'll find it in soil, plants, indoor air and food. Textiles, stored food, cardboard, paper and electric cables can also house Alternaria. This type of mold has a club-shaped appearance and tends to grow single or in long chains. When they grow in big colonies you'll see that they are black, gray or green. Allergic symptoms to Penicillium can range from red rims or dark circles under the eyes, runny nose, water eyes, sneezing and nose rubbing, to symptoms like an itchy throat, crusted and swollen eyelids, skin rash, blocked nose, conjunctivitis, post nasal drip and chronic sinusitis. You'll find Penicillium in decaying vegetation, air, soil and other places. This particular type of mold will ruin food, grow on leather and definitely thrives inside. Those with mold allergies can have allergic reactions to this mold. 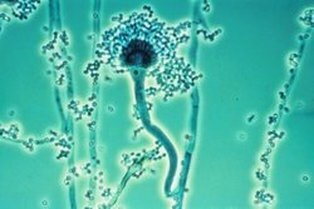 Penicillium is most known as a blue or green mold because they grow in colonies that are loaded with spores with a yellow, blue or green hue.